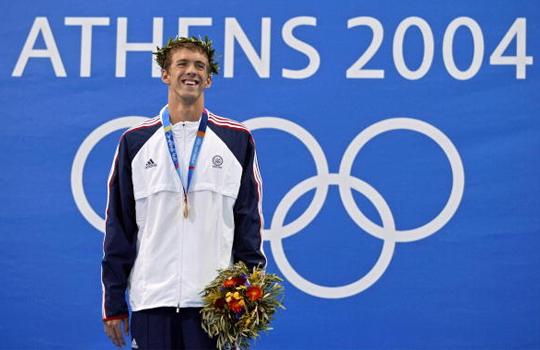 In his first event in the 2004 Olympics, Phelps won the gold medal in the 400m Individual Medley with a world record time of 4:08.26. 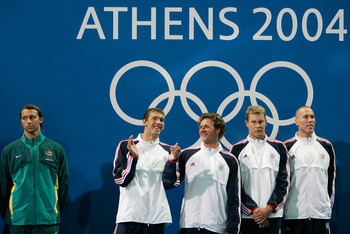 With Ian Crocker as the lead-off leg, and suffering from an illness, Phelps along with Crocker, Neil Walker, and Jason Lezak, finished in third place with a time of 3:14.62. They received the bronze medal. Deemed the Race Of the Century, this was the last time that Phelps would settle for anything other than gold until the London Olympics. Phelps went up against the other three fastest 200m swimmers in the world at the time: Australian swimmers Ian Thorpe and Grant Hackett, and Netherlands legend Pieter van den Hoogenband. 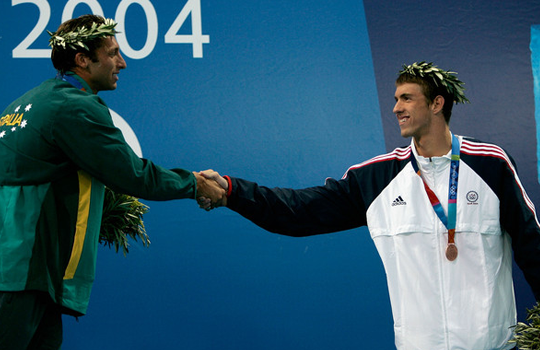 Phelps set an American record with a time of 1:45.32, but it was only good enough to earn him a bronze medal.